Copper has been used for centuries because it is considered amongst the most versatile engineering materials available. It has impressive physical properties, such as strength, corrosion resistance, conductivity, machinability, and ductility. Because of its benefits, it is used in an extensive range of applications. Properties of copper alloys can be enhanced through plating wire and other manufacturing methods. Copper is frequently used in the building industry for things like heating systems, cladding, electrical wiring, water pipes and fittings, and oil and gas lines. The materials are also commonly used in electronic products, consumer products, and industrial machinery. Wrought copper alloys are made using a variety of production methods, which include rolling, drawing, stamping, and extrusion. After, it is suggested that annealing or cold work happen through heat treatments. For more information on copper and copper alloys like Phos Bronze Alloy 521, you should contact us through the website or directly call our sales department. 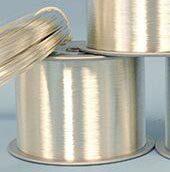 We also work with plated wire to enhance the qualities of beryllium copper and copper alloys. We carry 521 alloy. Knowing desired applications and use allows for optimal purchases to be made, like acquiring 521 alloy. Typical alloys include beryllium copper, carbon steel, and zinc.